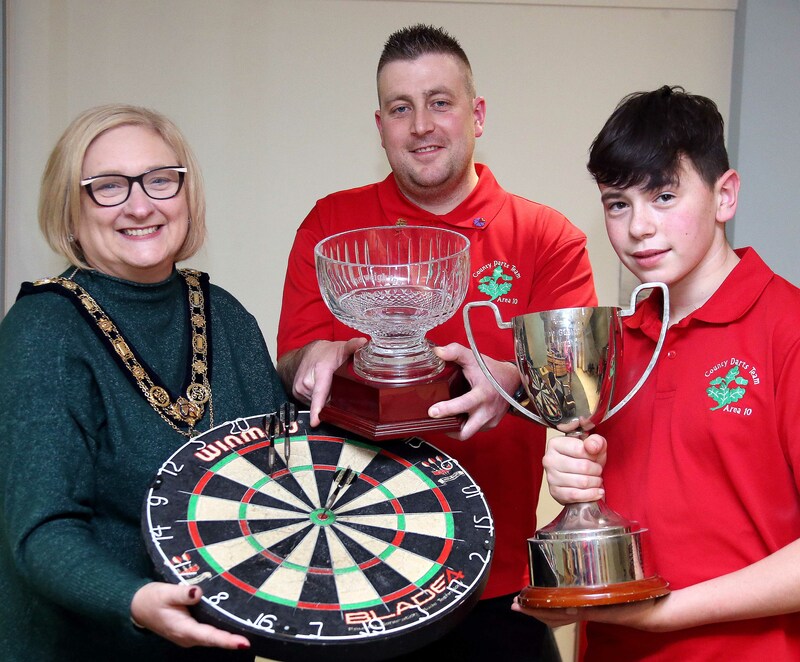 The Mayor of Causeway Coast and Glens Borough Council has hosted a reception for Area 10 North Derry County Darts members. The event took place in the Mayor’s Parlour in Limavady on Wednesday 21st November. The organisation was founded in 2011 by Michael McCloskey and Mary McCrea and since then it has went from strength to strength. Area 10 North Derry County Darts is a cross community organisation which welcomes players of all abilities. It is now actively seeking new members especially youth players. The group would ask that any youth interested in competing should contact Mary McCrea (Chairperson) on mary.mccrea@btinternet.com for further information. As part of her role as an Northern Ireland Darts Organisation Executive Officer in charge of Youth Development, Mary is willing to attend any youth clubs, schools or groups to discuss youth darts and offer any help or guidance. 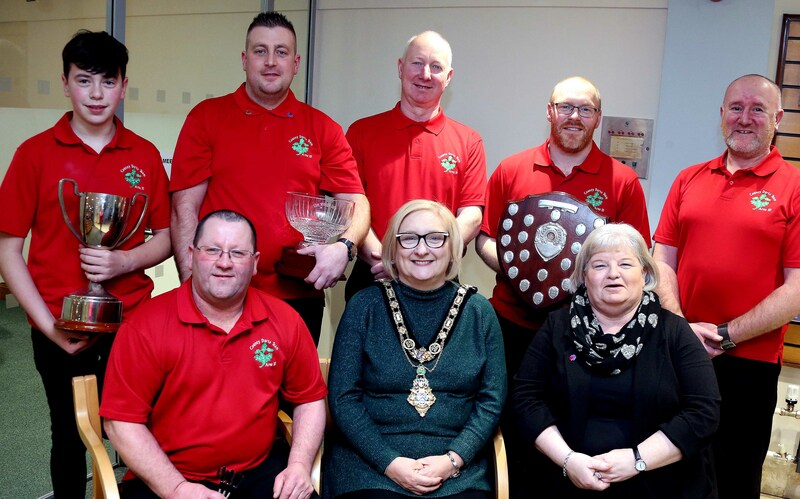 The Mayor of Causeway Coast and Glens Borough Council Councillor Brenda Chivers pictured with Area 10 North Derry County Darts members including Chairperson Mary McCrea, Michael McCloskey, Travis Baur, Gavin Carlin, Dominic Begley, Dermott McGuinness and Paddy McGinnis. 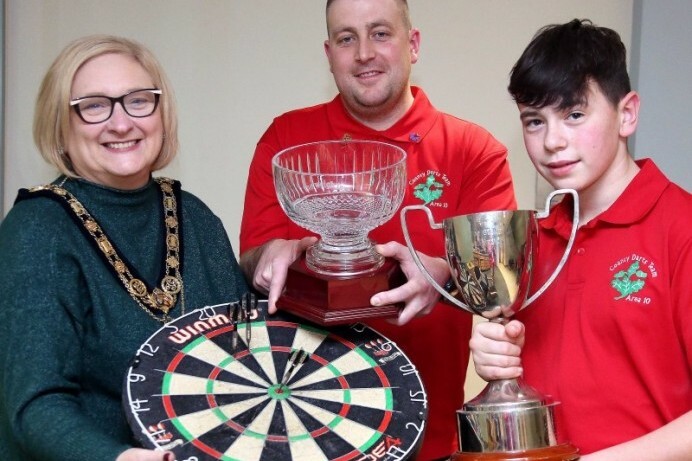 The Mayor of Causeway Coast and Glens Borough Council Councillor Brenda Chivers pictured with Area 10 North Derry County Darts member Gavin Carlin from Claudy, winner of the 2018 Weigh Inn Irish Open and Travis Baur from Limavady, winner of the 2018 Donegal Youth Open.